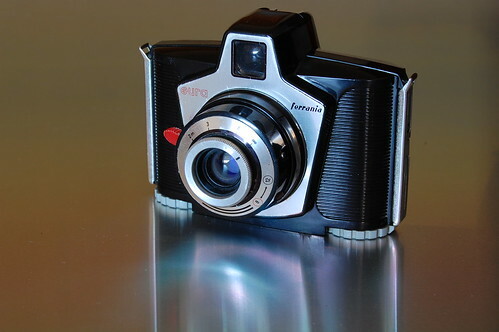 The Ferrania Eura from 1960 is an inexpensive consumer box camera made of plastic and aluminium that produces 6x6cm exposures on 120 rollfilm. It is fitted with a simple meniscus lens and spring-operated shutter. The Eura is most notable for its sleek Italian styling, which appears modern even today. Ferrania Eura camera manual in PDF format, multiple languages from OrphanCameras.com website. This page was last edited on 30 October 2018, at 05:11.